Panama is a country in Central America, and it has coastlines on both the North Pacific Ocean and the Caribbean Sea. It is most appealing for tourists because it has diverse attractions. In one single trip, you can see mountains, beaches, historic ruins, and modern cities. As you can imagine, since there are two coastlines, there are a lot of beaches in Panama, and you have access to almost all of them. You can also go scuba diving and snorkeling, but if you feel like hiking, there are several trails available throughout the country. Nevertheless, what you cannot possibly miss is the jungles near the Canal area. Flora and fauna are incredible. 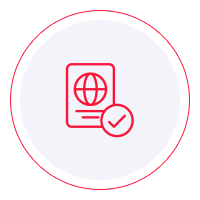 Before you travel to Panama, you need to check whether or not you require a visa to enter the country. Fortunately, the visa policy of Panama is pretty lenient, and chances are that you can travel to Panama without a visa and stay there for a period that cannot exceed 180 days. Many nationalities are granted visa-free access, and you may be one of them. All the other nationalities must visit the nearest embassy of Panama and apply for a visa that allows a 90-day stay. If you want to find out quickly in which category of travelers you are, visa-free or not, you can take a look at Panama’s visa policy and see for yourself if you find your country of origin on the list of visa-free countries. However, we have a better idea. You could use iVisa’s Visa Checker. The information you need is just a few clicks away. Click on the Visa Checker button located in the top-right corner, select your country of origin in the menu on the left, and choose Panama in the menu on the right. The result will display whether or not you need a visa, and if you do, you will get a list of the nearest embassies where you can apply. iVisa does not process Panama visa applications, so we cannot help you get your visa for Panama. However, we are still eager to provide assistance, which is why our support service is at your disposal 24/7. The service is free of charge. If you find out that you do require a visa to travel to Panama, you need to learn about the requirements so that you can meet them. The internet is full of such information, but we recommend that you take it with a bit of skepticism and use it as a reference only. The information you find online is not always the most reliable. That is why our suggestion is to call the embassy or the diplomatic mission and ask them about the requirements. That way, you get the info you need from a reliable source. In the meantime, what we can tell you is that all travelers who plan a trip to Panama need a valid passport that remains as such for at least another 3 months from the date of arrival in Panama. We regret that we cannot help you with your Panama visa application process, and we hope that the information above is useful.